The Biota was the creation of John Houghton in the late 1960s. John's racing background ensured that the Biota was a credible Mini based special which had much hillclimb success. The base of the Biota is the spaceframe chassis to which the Mini front subframe attached along with the rear suspension. As with most Mini based specials the Biota is small and combined with its sporting ambitions is also low and light. As such the Biota sports a large bonnet bulge to accomodate the Mini engine. 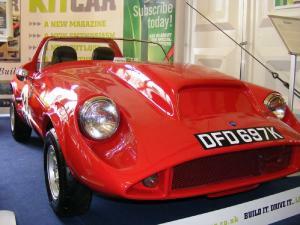 The body consists of fibreglass panels including a distinctive roll over hoop. Windscreen is flat glass in a metal frame. The end result is a pretty little car. Around 30 cars where made during its life with a Mk2 also being produced with improved rear end suspension and some body modifications.